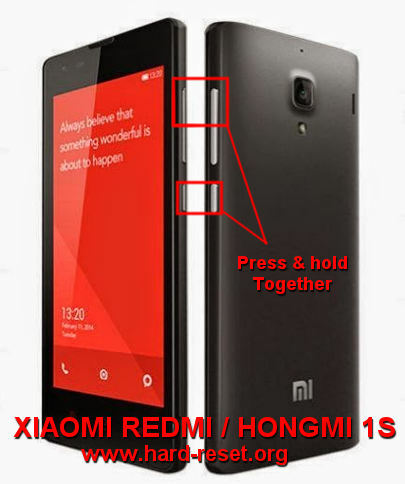 Solutions for fix problem at XIAOMI REDMI 1S / HONGMI 1S. Xiaomi is very famous now when they start to publish good quality smartphone with low price, because they do not have to give too much promotion budget like what Samsung did or any other big brand. XIAOMI REDMI 1S / HONGMI 1S is the favorite for most Android starter or middle user to have good smartphone with quad core at 1.6Ghz clock speed using Qualcomm processor. For user who like to get good photography, then XIAOMI REDMI 1S / HONGMI 1S also have 8 megapixel camera with autofocus and LED flash to help getting better pictures when taking pictures at low light situations. This low price smartphone from Xiaomi also already have 8 GB internal memory and 1GB RAM for better multitasking applications. How to Fix or Problem Solving for Recovery XIAOMI REDMI 1S / HONGMI 1S hang or not responding or malfunctions or stuck or freezing or bricked ? XIAOMI REDMI 1S / HONGMI 1S have 8 GB for internal memory, but we will get it less that 8GB, because this capacity also use to save the operating system and factory default installed applications. We can install many applications from Google Play Store because this phone also have 1GB RAM and using Quad core processor at 1.6Ghz clock speed. But some applications maybe not compatible with XIAOMI REDMI 1S / HONGMI 1S, sometime it can make our Xiamon Redmi 1S become trouble like hang or bricks or broken or blank or freeze or boot loop or LCD touch screen not responding. At this time, we should have to force shutdown or force soft reset to remove any temporary files or cache from XIAOMI REDMI 1S / HONGMI 1S. If the problem still happen after doing reboot, then we should do hard reset or master format. Please do backup all important data to other safe locations, because all important data will be wipe or removed from XIAOMI REDMI 1S / HONGMI 1S. We also recommended to remove the MicroSD external memory before performing hard reset. How to Force Soft Reset or Reboot or Restart XIAOMI REDMI 1S / HONGMI 1S ? What should we do when XIAOMI REDMI 1S / HONGMI 1S get hang or freeze? We should performing force shutdown but press and hold POWER Button for several second until this phone shutdown by itself. Wait about 5 seconds and please turn on again to start the operating system again. At normal conditions, we can do soft reset or reboot while this phone at On positions, press and hold Power Button several seconds until the pop-up menu appear, please choose Shutdown or Reboot or Turn Off to finish soft reset. How safe is soft reset? Basically the step to do soft reset or reboot or restart is safe to do anytime, because it will not remove any important data or will not remove any installed applications. Therefore, we can perform this steps anytime we want. Please make sure the battery is not empty, better if we can make it at least 50% capacity. The XIAOMI REDMI 1S / HONGMI 1S will do the hard reset or master format process. Wait until the XIAOMI REDMI 1S / HONGMI 1S finish the process and the phone will start again like new. How to Boot at Recovery Mode at XIAOMI REDMI 1S / HONGMI 1S ? At some situations, we need to boot our XIAOMI REDMI 1S / HONGMI 1S go to recovery mode. We can follow the steps at #Option 2 above from steps no.1 until no.4. After that we will find the menu and choose the menu as what we need to do. When release to the market, XIAOMI REDMI 1S or HONGMI 1S already use Android Jelly Bean operating system. After using several period, some users maybe get problem with the operating system or damage the firmware. At this time, maybe we should reinstall or restore clean factory default Android operating system to our XIAOMI REDMI 1S / HONGMI 1S. We should know that the clean factory default Android operating system already saved safely inside XIAOMI REDMI 1S / HONGMI 1S ROM. Therefore, we does not need to connect or copy anything from other gadget. Just follow the hard reset steps above, then the operating system from internal ROM will be reinstall automatically. Please note, doing reinstall will remove all important data at our internal memory, so please do backup first. There are also other alternative to reinstall or restore the XIAOMI REDMI 1S / HONGMI 1S operating system by download the official MIUI ROM for XIAOMI REDMI 1S / HONGMI 1S at Xiaomi website, copy the downloaded file to SDCard using computer with external memory card reader, or connect directly the XIAOMI REDMI 1S / HONGMI 1S to computer and it will read it as removable drive. Copy the downloaded files at external memory and please continue by using XIAOMI REDMI 1S / HONGMI 1S applications which have name Updater. Follow the menu to finish the upgrade. How to Unlock or Fix or Bypass or Solutions for XIAOMI REDMI 1S / HONGMI 1S forgot password code or security lock screen pattern or pin (lost password)? There are already several options to give more security protections at our XIAOMI REDMI 1S / HONGMI 1S. Sometime some users have important and confidential data their phone. We recommended to use screen lock pattern for security protection because it is more easy to use and faster to open, but some users also like to use password pin protection. All of that security protections can give more safe state for our phone. However, the problem comes when we forget the answer for that security protections. But Android already have steps to bypass or unlock forgotten security protections using Gmail username and password or Google account. Please try to give several time wrong answer again and again continuously until the XIAOMI REDMI 1S / HONGMI 1S locked or freeze about 30 seconds. We will find Forgot Password / Pattern button to bypass the protection using Google account that we have already signed in before. If we can not access the Google account, then we have to do hard reset or master format. How to Improve Performance XIAOMI REDMI 1S / HONGMI 1S to make run more faster? The Quad Core processor at XIAOMI REDMI 1S / HONGMI 1S should run smooth for most applications, the 1GB RAM also give good benefit to run multitasking applications. But some users feel that the XIAOMI REDMI 1S / HONGMI 1S run become slowly after use several months. Mostly this problem comes because there are too many applications run at this phone, especially the applications that run in the background. Some apps that we install from Google Play Store will keep run in the background without any notifications, they have to do this for waiting some command or update data to Internet. Every applications running at Android will need some amount of RAM and use processor resources. If there are too many applications run in the background together, of course this will make the XIAOMI REDMI 1S / HONGMI 1S run more slowly or the worse will make some other trouble and can not run smoothly. To make XIAOMI REDMI 1S / HONGMI 1S performance run faster again like new, then we have to do hard reset or reformat this phone to clean all installed applications and return back the clean operating system. Is that any other secret code of hard reset XIAOMI REDMI 1S / HONGMI 1S? At this moment, there is no other secret code or secret key to do the factory reset of XIAOMI REDMI 1S / HONGMI 1S. Just try to do the hard reset above. After Doing Upgrade ROM or Operating System XIAOMI REDMI 1S / HONGMI 1S, The Google Play Store is Disappear. How to Install Google Play Store at XIAOMI REDMI 1S / HONGMI 1S ? Unfortunately some XIAOMI REDMI 1S / HONGMI 1S smartphone produce only for China market, it will not include Google Play Store at internal memory. How to install Google Play Store to our XIAOMI REDMI 1S / HONGMI 1S? Do not worry, because we can download the Google Play Store easily at XIAOMI REDMI 1S / HONGMI 1S. We need to know, by default Xiaomi have their own application store which have name Mi Market. We can use Mi Market to download Google Play Store to our XIAOMI REDMI 1S / HONGMI 1S. Please Sign-in first before we can use Mi Market. After we finish sign-in into Mi Market, please try to search with keyword Google, you will find applications which have name Google Installer (by Eric Xiang). Please install this applications and after that we can run this applications and we will see all Google applications including Google Play Store that we can install to our XIAOMI REDMI 1S / HONGMI 1S. There are also other alternative steps to install Google Play Store at XIAOMI REDMI 1S / HONGMI 1S, download Google Apps zip file which fit to our active ROM, rename it to update.zip and move this file to our external microSD card. Boot our XIAOMI REDMI 1S / HONGMI 1S to Recovery mode and Install it with Recovery mode. Please note, some steps may not always running we at our XIAOMI REDMI 1S / HONGMI 1S, this is because there are several firmware or hardware available in the market that need special steps to do all steps. What is Dragontrail Glass at XIAOMI REDMI 1S / HONGMI 1S ? This is the scratch resistance glass that use at XIAOMI REDMI 1S family. If we are familiar with Gorilla Glass, then this is the same functions to protect the glass with strong scratch resistance, but the Gorilla Glass vs Dragontrail are different company and different market. Some brand also use Dragontrail like Nexus, Sony Xperia and some other more, but please note, the same company will use Gorilla Glass and Dragontrail for different product. How to Improve Battery Life Longer of XIAOMI REDMI 1S / HONGMI 1S For Solving Battery Drain Faster Problem (Battery Saving / Extent Battery Life)? The battery power capacity of XIAOMI REDMI 1S / HONGMI 1S is 2000 mAh, this capacity is not too small, for some users, they can use this phone fully one day without need to charger. However, there are several user who also have problems with battery life fast to drain because they are intensive users and install many applications together in this phone. Please note, some applications which run in the background sometime will keep data update from Internet, and of course it will make battery fast to drain as well. The LCD screen is one of battery consumption, therefore we recommended for battery saving to keep LCD brightness as low as we like. Please turn off some not use connections like Bluetooth, Wifi, GPS and several other mode. Using GSM 2G will make battery stronger, but it will make Internet data connection become slowly, we can use it at emergency conditions for battery. [A] Hi, it seems that your Xiaomi Redmi 1S is not use official International ROM. The Chinese ROM does not have Google Play Store by default. You should download it from Mi Store and find / type Google. You will see some applications appear as search result, but maybe it will show Chinese language. If you can not read Chinese character,then you can chose something with Google Play Store icon logo with Play icon. Then follow and continue with the steps. [A] Hi, you can try to find word emmc, then try to follow the steps until ot is formatted to factory default. Some users may get english recovery menu and some users get Chinese characters at their Xiaomi Redmi 1S. The information from this page describe about how to format redmi 1s,redmi 1s hard reset,how to hard reset redmi 1s,how to format xiaomi redmi 1s,format redmi 1s,how to format redmi note,hard reset redmi 1s,how to reset redmi 1s,mi HM note 1s factory reset,mi s1 format setting. If you need another resource for hard reset, use search function at this homepage or find from our related posts. How to Easily Master Format SONY XPERIA C5 ULTRA (DUAL) (E5553 / E5506 / E5533 / E5563) with Safety Hard Reset? How to Easily Master Format XIAOMI MI4 / Mi 4i (LTE / Dual) with Safety Hard Reset? Hi, be default REDMI 1S already use official MIUM operating system, if you would like to install non official or custom MIUM then please do it carefully because some wrong steps can make your phone get trouble. Hi, you can try to find word emmc, then try to follow the steps until ot is formatted to factory default. Some users may get english recovery menu and some users get Chinese characters at their Xiaomi Redmi 1S. hi! my phone had stuck with MI logo,so by watching some youtube video i could do proper booting of my phone. but now i am not able to install any google apps and the phone is not supporting any google account. another important issue is that after booting by watching the video the language settings is changed to chinese and i am not able to set it for english language as there is no option for that setting. i am not able to install whatsapp or any other apps. can i get a solution for this please… its urgent…. Hi, it seems that your Xiaomi Redmi 1S is not use official International ROM. The Chinese ROM does not have Google Play Store by default. You should download it from Mi Store and find / type Google. You will see some applications appear as search result, but maybe it will show Chinese language. If you can not read Chinese character,then you can chose something with Google Play Store icon logo with Play icon. Then follow and continue with the steps.